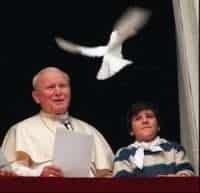 John Paul II was one of the most charismatic popes in recent history, a rock star who attracted millions during his frequent trips abroad and who was considered a beacon of hope for people in his native Poland. 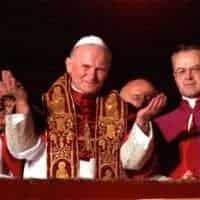 Born Karol Joseph Wojtyła on May 18, 1920 in Wadowice in southern Poland, he was elected pope in 1978, the first non-Italian pope in 500 years. He was critically wounded by a Turkish terrorist while in St. Peter’s Square in 1981; he later took the unprecedented step of meeting his would-be assassin in his prison cell. 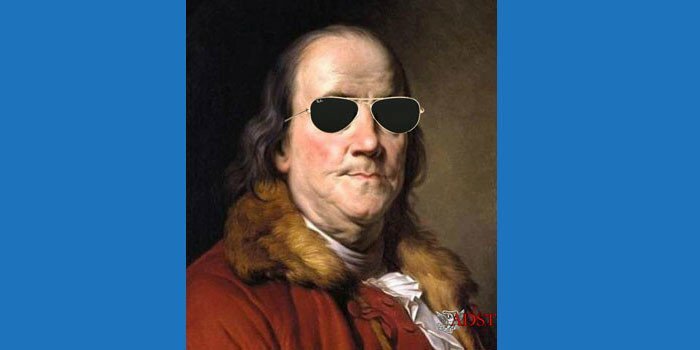 He was fluent in eight languages and his pontificate, which lasted more than 26 years, was the third longest in history. He greatly expanded diplomatic relations with other states, from 85 countries in 1978 to 174 countries in 2005, including the U.S. The man who oversaw a record number of canonizations was himself canonized on April 27, 2014. In these excerpts, Leslie M. Alexander recounts meeting the then archbishop while skiing; he was interviewed by Charles Stuart Kennedy beginning in October 2005. Richard A. Virden discusses the excitement Poland felt when it was announced he was elected Pope; he was interviewed by Kennedy beginning in March 2011. Carl Bastiani, who retells a joke about the Pope he heard from Krakow officials, was interviewed by Kennedy beginning February 2008. Ambassador Robert M. Sayre, interviewed by Thomas J. Dunnigan starting in October 1995, talks about his efforts to resolve a conflict between Chile and Argentina. Peter K. Murphy was interviewed by William D. Morgan in April 1994 and talks about the USSR’s concerns and the assassination attempt against the Pope. 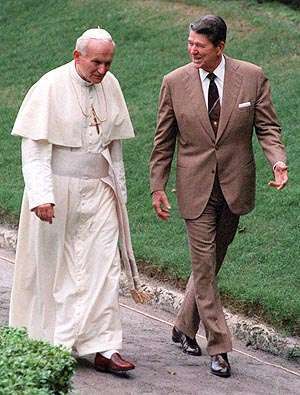 Ambassador Thomas P. Melady recounts the historic meeting between the Pope and President Reagan; he was interviewed by Kennedy beginning in January 1995. You can also read about different encounters with Mother Teresa throughout the years. ALEXANDER: The role of the Church was enormous. Most Poles were practicing Catholics, unusual when you consider that in France, another predominantly Catholic country, maybe one of every four or five Frenchmen went to church on a regular basis in the ‘70s. I would say that 65 percent of the Poles attended church fairly regularly. The archbishop of Krakow, where I was stationed, was an enormously popular figure and went on to become Pope. In fact, the first time I met him was skiing just south of Krakow, in Zakopane. 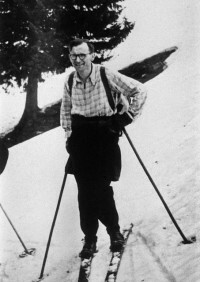 He was dressed up in a ski outfit that looked like something from a 1930s Hollywood movie with the long wooden skis and the short pants. And a Polish gentleman I knew said, “Would you like to meet the archbishop?” And I said, “Yes, are we going to do this next week, Monday?” “No, right now, would you like to meet him?” I said, “But we’re skiing.” He said, “Yeah, well he’s skiing too, he’s right over there.” And I said, “No, you’re kidding me.” And sure enough, it was him. He was a very, very stocky, powerfully built man. You could tell he was probably, well in fact he was, an athlete. I think it was that kind of activity, seeing the archbishop skiing around, that endeared him very much to the Poles, and the priests were, for the most part, widely respected, admired. They were courageous. Many of them were persecuted by the regime. The Poles looked to them as the voice, the vision of an honest, free Poland and I think the Church took on significance in Poland that it hadn’t had in generations in Europe. VIRDEN: All this was happening in my first few months in Warsaw. Another highlight that first fall was attending the opening of the academic year at the Catholic University in Lublin (KUL), then the only private university in that part of the world. It had a long, proud tradition including a library whose core collection that had been brought from a Catholic seminary in St. Petersburg at the time of the Russian revolution. Part of what the U.S. embassy did – and other Western embassies, too – was to send representatives to Lublin for KUL events, to demonstrate our support for the university and the freedom it represented. So that fall I went to Lublin for ceremonies marking the opening of the 1977-78 academic year and there met Cardinal Karol Wojtyła, who a year later would become the first non-Italian Pope in 500 years. At this time he was an adjunct professor at KUL, in addition to his duties as the cardinal of Krakow. In their ceremonies, the KUL administrators would traditionally acknowledge, one by one, all the representatives from Western embassies. The Minister of Religious Affairs, a Communist Party official, would sit there quietly, fuming perhaps, as we stood up to show our support for principles like freedom of speech, inquiry and religion. It was delicious political theater. Pregnant stop, then on to something like, “And now, here’s the latest tractor production news from Ursus.” The announcer didn’t have any instructions yet, no one telling him what to make of the news, what it might mean for the party and the country. The Polish people didn’t have any doubts though; in Krakow they poured into the streets and squares, and church bells – included one that had rung only once before in a century, at the end of the Second World War – pealed all that night. Just over half a year later, the next June, John Paul II came home for the first time as Pope. It was an overwhelming, transformative event. Nearly half the population, more than 15 million people, came out to see him as he traveled around the country for six days. Most Poles were clearly giddy that one of their own had been selected to lead the Roman Catholic Church. But it was more than simple pride, too. Ordinary citizens could see that they were not alone in identifying with what the new pontiff and his church stood for: Western values and opposition to the regime they were forced to live under. It was not only extremely moving but also the beginning of the end of communism in Poland and that whole part of the world. The Church, after all, was the center of opposition. It represented Polish nationalism. It was the focus point of opposition to the communist regime – and not only symbolically. Church leaders would do things like having “flying universities” in church basements and put out underground publications. Communism was not a system of Poland’s own choosing; it had been imposed on them by the Soviet Union after the Second World War, and several decades later it had still not won any legitimacy. One way to express opposition to it, in Poland, was to work with the Church. Church activity was not only religious but also very political during this period. 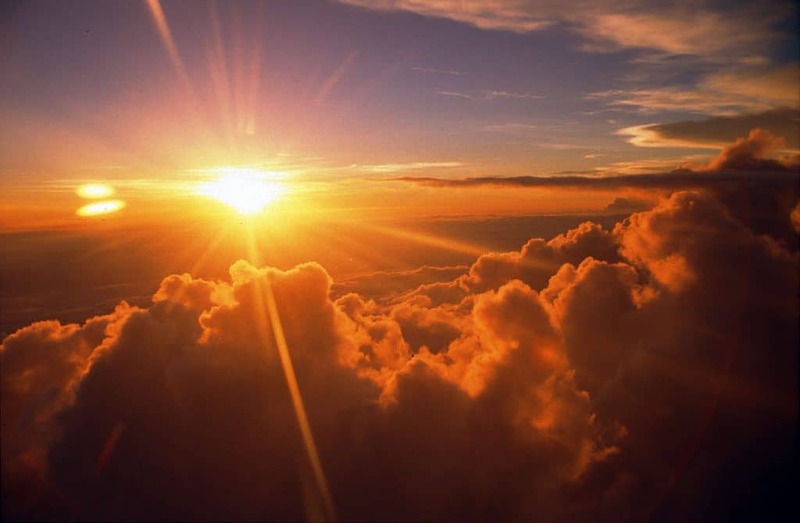 So when a Pole become head of the Roman Catholic Church, and then came home in triumph, people felt they were not alone; it was the end of a kind of isolation, the first thing Poles collectively had to be happy about together in decades. Remember, it was the very next year that Solidarity – the trade union and political movement – burst on the scene and quickly attracted something like 13 million members. One thing built on the other. 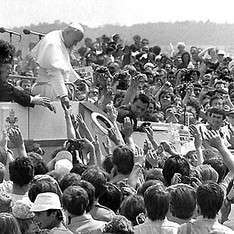 On the first day of his 1979 visit, the Pope said a mass in the main square in Warsaw (once called Adolf Hitler Square), and an estimated million people were there for that. I felt very privileged to be one of them. The Pope’s homily included many political allusions, and they were not missed by many Poles, who know their history. He was young and vigorous and confident, and all of that came across and really energized the crowd and Poland’s political life…. In that first homily, John Paul II [made]…an allusion to the Russian Army sitting just across the Vistula River and not acting when the Poles rose up in August of 1944 to try to throw out the Nazi occupiers. Something like 200,000 Poles died in the two months of that uprising, and the Russians were right there and did nothing. On the other hand, when he went to Auschwitz-Birkenau on this same trip, John Paul noted that many Russians were among the victims who died there, and he talked about the need to bind up the wounds of war. Then he walked alone over to the ruins of the crematoria and knelt in silent prayer. Again, I felt very privileged to witness what was a very profound moment. The Party leaders readily received me for official calls, and our conversations were quite friendly. You would never have guessed that we were on opposite sides in the Cold War. One, the Krakow First Secretary, obviously showed pride as a Pole in the election of Wojtyła as Pope, by telling me a joke. John Paul II had made his first visit just prior to my arrival. The story is that the Pope had just taken off in an airliner. The stewardess asked if he’d like a drink. She said, “About 5,000 feet,” and he accepted the drink. Later, she asked again, got the same question about altitude, and the Pope accepted a second drink. Then, after they were cruising at 30,000 feet, she asked if he wanted another. SAYRE: We had a visit with Pope John Paul II. One of the issues that I discussed with Pope John Paul II was the major dispute between Argentina and Chile over the Beagle Channel. Because they couldn’t get it settled any other way, I had recommended to the Department of State in 1979 that because I thought both Argentina and Chile would accept the Pope that he be asked to arbitrate the dispute. The Department did. He arbitrated it. They came to an agreement in November 1985. But between the time that I made the recommendation and the time the Pope agreed to arbitrate, the Argentine army went to sea to fight the Chilean navy. The Pope intervened before the Argentine navy started shooting at the Chilean navy; so a war was avoided between Chile and Argentina. When the Pope came to Brasilia in June of 1980 I talked to him about it. He was very pleased that he had been able to do something, get involved in it and negotiate a settlement. He negotiated a rather ingenious settlement and both Argentina and Chile accepted it. Give the credit to Pope John Paul II. MURPHY: With the election of a Polish Pope in October of 1978, the Soviets soon realized that they had a serious problem on their hands. All this happened long before I arrived in Rome, of course, but in the early days of my tour at the Vatican I began to focus on the Kremlin’s efforts of disinformation which were directed at blocking the Vatican’s efforts to promote human rights in area under Soviet control. It was evident to us that the Soviets saw John Paul II as a direct threat to their values and beliefs – and above all – their power. Their initial reaction – in addition to spreading propaganda injurious to Vatican interests – was to clamp down on Catholic clergy in Lithuania, Ukraine, Latvia, as well as, in Poland and Hungary, and the then Czechoslovakia. From several sources, we at the Embassy noted the general hardening of the Communist authorities in the face of organized religion. This was particularly evident in Ukraine. Several reports of flagrant human rights violations were sent from our Embassy to Washington in 1984 and 1985. I also saw evidence, during this period, that the Russian Orthodox Church was enlisted in the fight against Rome. This was particularly noticeable in statements emanating from the Moscow Patriarchate and from Russian Orthodox delegations attending international meetings — such as the World Council of Churches in Geneva. The Soviets knew, I believe, that the Catholic clergy in the nations of their empire was not loyal to the communist masters in the same manner that the State-supported Orthodox Church was loyal. The situation was aggravated, in the eyes of the Soviets, by John Paul’s triumphant visits to his homeland; the gathering strength of the Solidarity trade union; and especially the manner in which Lech Walesa was received by the Pope at the Vatican on the three occasions he was permitted to visit Rome. Some said that Walesa’s reception was akin to that of a head of state. 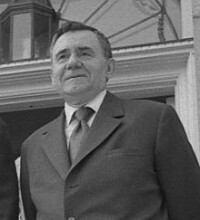 Andrei Gromyko, the old Soviet war-horse Foreign Minister, had visited John XXIII, Paul VI – and also John Paul II in the course of his long career. Following each of his Papal audiences, the announced subjects of discussion were the inevitable problems of human rights and religious freedom in areas of Soviet control. Gromyko, I often heard at the Vatican, had a much more difficult time in deflecting John Paul’s questions than he did those of John Paul’s predecessors in the job. We kept a very close tab on all contacts or statements by the Holy See which indicated an opening to the Soviets – or to nations in the Soviet camp. For example, the visits of the Soviet Army Chorus to the Vatican; Papal greetings delivered in the Russian language; Soviet university students being received with other European students – but being singled out for special Papal attention; visits of “roving” Soviet Ambassadors to the Secretariat of State, etc. All of this activity – no matter how seemingly insignificant – was duly reported to Washington. Cooperation between the U. S. government (especially the White House) and the Vatican during my years in Rome was quite remarkable for its closeness and must have been a most worrisome fact of political life for the Soviets. This was due to several factors: the personalities of John Paul II and Ronald Reagan; United States interest in human rights in general and especially in exploiting Solidarity’s struggle against General Wojciech Jaruzelski – the Polish leader and — if I might add — the presence of a new American Embassy at the Holy See. This was concrete evidence that U.S.-Holy See cooperation was flourishing. I well remember the joy expressed by the Pope when I informed him at Castel Gandolfo that our Congress had voted the sum of $10 million to support the struggle of the Solidarity movement in his native land…. So who ordered the shooting of the Pope? That question dominated my four years at the Vatican. I can tell you honestly that I don’t know. 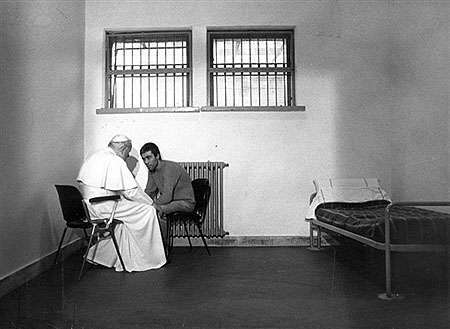 The Turkish gunman who is spending the rest of his life in an Italian prison for his actions, Mehmet Ali Agca, was caught in the act of attempting to assassinate John Paul II on May 13, 1981 in St. Peter’s Square. 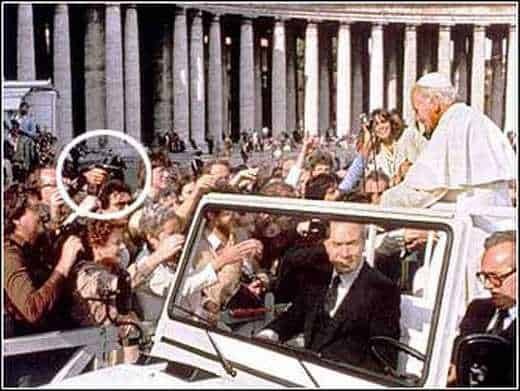 The actual facts surrounding the attempted assassination of the Pope remain a mystery to this day. I, of course, never asked the Pope about this incident – but on more than one occasion I discussed the shooting with his personal Polish secretary, Msgr. Stanislaw Dziwisz. One conversation took place just a few days after the Pope paid Ali Agca a visit in the Roman prison. You’ll recall, that the Pope and the Turk met for over an hour at the prison — with no one else present. The room had been de-bugged prior to the meeting – at the Vatican’s insistence. No statement was issued after that historic meeting. The Papal Secretary told me the Pope did not say one word to him about the meeting — but, as soon as he returned to his study at the Apostolic Palace, he wrote a detailed report in his own hand, sealed it with the Papal ring and put it in a safe. The Pope, according to Dziwisz, told him that the letter should not be opened for many years. John Paul II also said: “If this information were to be made public now, the economies of several nations would be dramatically affected.” The Pope explained no further. We must remember the timing of this statement — 1985 — long before the fall of the Berlin Wall and the collapse of Communism throughout Eastern Europe. As you are aware, our government conducted very serious and comprehensive investigation into the Papal assassination attempt, in which I played a part on several occasions. Someday it will make fascinating reading. I don’t believe that I should say any more about this delicate subject at this time. It’s interesting. By the time I got there the Papal advisors were saying the same thing at this Polish Pope, “Don’t be talking about it.” Well, lo and behold, neither President Reagan or Pope John Paul II followed the advice of their experts. I remember Time Magazine about 1991 had a major cover story, The Holy Alliance, and a picture of the Pope and Reagan. The article, with the exception of the first five paragraphs, was really quite accurate. With a handshake, without a formal treaty, there was never anything written — I know that — the United States and the Holy See cooperated in one of the greatest events in modern history. The collapse of an empire without, relatively speaking, any major bloodshed.